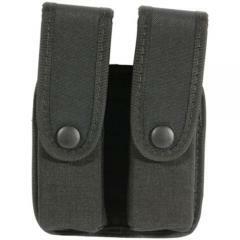 This double magazine case from Blackhawk is designed to hold two Glock 10mm or .45 magazines. Each one sits in its own independent holder, enhancing protection and security. It is made from durable and abrasion-resistant Cordura, and includes a molded insert that enhances its shape retention and impact resistance capabilities. Each pocket features a separate flap with a polymer stiffener for quicker, easier opening. They fasten down using no-glare snap closures that provide reliable security while also allowing quick access for a rapid reload. The pouch attaches to the belt horizontally or vertically using a molded belt loop.